Fiona Apple says, i’ve got my feet on the ground and i don’t go to sleep to dream. Mugwort. Photo by Andrey Zharkikh, CC BY 2.0. Those who cannot attain or are denied normal REM sleep suffer deeply, as they lose out on the mood-regulatory functions of dreaming. Dreams are an opportunity for the subconscious to go to work on the troubles and lessons of the day, and integrate them into the deeper mind. They can serve as a form of emotional detoxification, in which highly reactive elements are broken down or joined with other complexes to be eliminated, rendered inert, or made newly useful. I have also come to regard dreams as an indicator of sleep quality. People with poor-quality, restless sleep will either dream intensely and disruptively – often as nightmares – or else dream not at all. The latter is more likely when sleep is unsatisfactory on a chronic, ongoing basis. 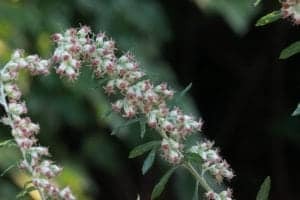 Mugwort (Artemisia vulgaris) has helped a number of my clients with disrupted sleep, specifically those who wake in the middle of the night and have difficulty falling back to sleep. Mugwort in formula with skullcap (Scutellaria lateriflora), passionflower (Passiflora incarnata), betony (Stachys betonica), and/or motherwort (Leonurus cardiaca) effectively improves the capacity to sleep straight through the night. There are a variety of traditional ritual herbs, such as Calea zacatechichi (“Aztec dream herb”) from Mesoamerica and Silene capensis (“Xhosa dream herb” or “African dream root”) from South Africa, which are reputed to enhance dream recall and intensity. These can be acquired with varying degrees of ease from online vendors, though clear information on sourcing and handling are not always easy to come by. Much of the draw of these herbs for North American psychonauts is, without doubt, derived from their “exotic” origins. On the other hand, there are a few herbs that are more widely known in the North/West, though not often regarded as oneirogenic herbs, which I have nevertheless come to regard as useful for dreaming. These include kava (Piper methysticum) and calamus (Acorus calamus) – the two of them together have a complementary set of effects, which serves to relax and warm the physical body while opening the sensorium into wide-angle perception. This allows for easier transition into dreamspace, when taken before bed. 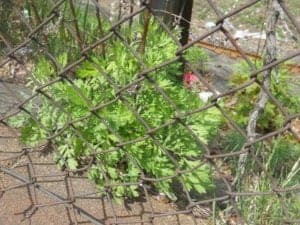 Mugwort growing behind a chainlink fence in Boston. Mugwort, Artemisia vulgaris, is the primary herb I recommend for dreamwork. It is inexpensive, ubiquitous as a human-following and city-thriving weedy herb, and entirely reliable for its effects on dreaming. If you tend not to remember anything about your dreams, mugwort will help you [re]collect bits & pieces; if you have spotty recall, it will help you construct a more complete narrative thread. If you have solely visual dreams, mugwort-enhanced dreams might have other senses engaged. Sound, touch, smell, and taste tend to emerge in that order. If you already have good dream recall and rich texture to your dreams, you may begin to become aware of your dream state while dreaming with mugwort. Then you are ready to practice lucid dreaming, the active manipulation of the dream state at will. Mugwort alone won’t make you a lucid dreamer overnight. This is a practice and requires consistent effort, including mindset-managing and intention-setting practices before bed, such as breathwork, visualization, and meditation. Keeping a dream journal is an important method for bolstering dream recall and enabling you to identify recurring patterns in your dreams. Tincture: 3 – 9 drops of standard tincture, taken just before bed. This is the simplest method for most people. Smoke: a pinch of mugwort in a pipe, alone or in a smoking blend, is as reliable. Tea: short hot infusion, 1/2 to 1 cup, as a component of a dream tea formula. We don’t want heavy sedatives here; cerebral circulatory stimulants combined with muscle relaxants seems to do the trick. Dream pillow: dried mugwort herb mixed with others (usually lavender, mints, or other aromatics) in a small pillow or sachet, kept near the pillow so it can be smelled as you lie down to sleep. Incense may also be used similarly. Flower essence: 1 – 9 drops of stock or dose bottle concentration. Enhances receptive qualities of the psyche, helps integration of unconscious with daily life. In any of these applications or formulations you might make, be sure to keep the sensory qualities of the herb undiluted. You need to taste it or smell it for it to work. With repeated use, you’ll build a sensory reflex by which the flavor or scent of the herb reminds you, mentally and physically, of the state of mind you’re trying to cultivate. Moony mugwort. Photo by Forest and Kim Starr, CC BY 2.0. Dreamsleep may be your most – or your least – restful. For me, when I dream deeply I wake up feeling invigorated and excited. For Katja, if she spends the night dreaming she feels as if she’s worked all night and not rested. You may find yourself in either camp. Regardless, it’s important not to force it every night. Dreaming is a me[n]ta[l]physical metamorphosis, and we can’t all go from caterpillar to butterfly every night! When not performing targeted dreamwork, allow your dreams to cycle naturally through phases of activity and rest. You might want to track these, and compare them with other cycles present in your life – days of work and play, waxing & waning phases of the moon, seasonal shifts, and so on. Speaking of cycle, be aware that for humans who menstruate, mugwort given in ‘physiological’ doses (1-9 droppersful of tincture, or a quart of tea over the day) can bring on the menses more rapidly and heavily than usual. 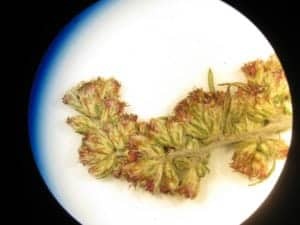 The doses we take for dreamwork are small in comparison, and don’t usually have this effect, but some very sensitive individuals may observe shifts in their menstrual cycle when they work with mugwort. Explore mugwort for dreaming when you have the time and inclination to give your subconscious and unconscious a little push dreamward. You may find a richer world than when you last visited!